Guides, tips, and hints for Deus Ex: Mankind Divided on PS4, Xbox One, and PC. Plus tips on how to get started as a complete beginner to the Deus Ex series. This page will serve as USgamer’s Deus Ex: Mankind Divided Guide Hub. Featured will be step-by-step guides to each of the different missions you can do in Deus Ex Mankind Divided. We will also be posting tips and guides on hacking, augmentations, and other helpful hints to get you moving forward. Our Deus Ex Mankind Divided Mission Guide section will detail how to complete both main and side missions from start to finish, as well as multiple paths and ways to beat them wherever possible. Any general advice that isn't related to a specific mission will go in our Tips section. You first mission will send you to an unfinished hotel in Dubai. We'll put you on the right path to victory. This side mission to remove a crooked police checkpoint and break up a forging ring is your first opportunity to test your skills after your augs are depowered. We'll help ease you into the transition. Waking up in Prague with your augs damaged, you have to fight through a gang of thugs to get to the guy who can fix them. We show you how to infiltrate the bookstore Vaclav Kollar is under siege in. Right off the bat, you're tasked with spying on the organization you work for. We'll show you a couple of different ways to bug TF29. Mankind Divided's most headache-inducing side mission pitting you against an all-powerful hypnotist leaves you defenseless in his wake. We'll show you how to navigate this perilous environment. A chance encounter with a street drug leads to the source of its production. We show you how to end Neon production. This mission has you tracking down the editors of the underground conspiracy theory newspaper Samizdat. Here's how you prevent them from blowing your cover. 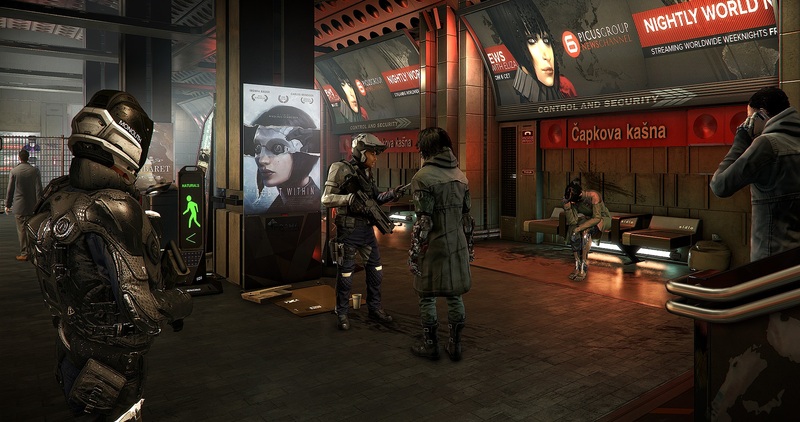 Hacking is essential for success in Deus Ex: Mankind Divided. Here's everything you need to know about hacking. In the Deus Ex series, playstyle matters more than most games, as they're built with a dizzying array of approaches in mind. It can be easy to get lost in all the possibilities. Here's some beginners tips to start thinking about as you prepare to play Deus Ex: Mankind Divided. Sneak or Shoot in Mankind Divided? 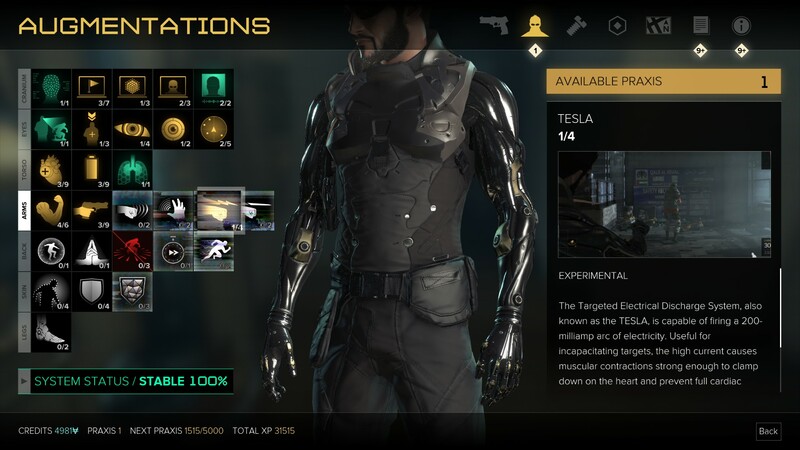 Deus Ex: Mankind Divided is, at its heart, a student of the Metal Gear Solid school of stealth game design, where you're given all the tools necessary to treat everything like a sneaking mission or simply just shoot everyone to death. If stealth is up your alley, get accustomed to darting between cover, as the rapid switch between first and third person can be hard to get used to. Understand how tools like the Glass-Shield Cloaking System, Leg Silencers, and Typhoon Explosive System, and get a feel for what combination of them will you incorporate into your stealth routine. Practice close-quarters takedowns to understand how close you need to be to take them down. For those who enjoy shooting, be prepared to haul around a lot of heavy equipment. You'll need to know how cover works, too, but you generally will want to keep your distance to some degree. Conventional first-person shooter wisdom applies here, so if you have a type of gun you generally favor in FPS games, go with that. Remember to keep in mind ammo counts and when you need to reload. Sniper rifles require you to come out of aiming mode to load another bullet. Learn what augs will shore up whatever weaknesses you have, whether that be shaky aiming, poor accuracy, or getting caught flat-footed a lot. Also, you're going to need to come to terms with the fact that some things in the game are just suicidal unless you stealth through them, so you're going to want at least basic proficiency in sneaking. Once you have access to leveling augs, you're given access to the entire spread. Keep in mind that most of the abilities you had in Dubai are gone until you level them again. You're going to want to prioritize augs that let you discover things early. Hacking is essential for getting through the many, many locked doors in the game, and pairing it with some points in Hacking Stealth increases your chances of not getting caught. Implanted Rebreather, Optimized Musculature, Punch Through Wall, and Klipspringer Jump Mod should be high on your list as well since they all let you explore more areas. Electromagnetic Pulse Shielding lets you walk on electrified floors, but at a cost of four Praxis, feel free to put it on the backburner for the time being. And Social Enhancer is a must for all verbal confrontations. Make a note of what combat augs you want as well. Stealth players should invest in the Glass-Shield Cloaking System right away, and guns blazing types should look at augs that increase your weapon prowess and durability. Be careful with leveling the new experimental augs, as they will overheat your system unless you permanently deactivate another aug branch. Before you start investing in some, become intimately familiar with both your moveset and your playstyle so you can identify what augs are safe to pitch. The overheating issue can be fixed if you do Vaclav Koller's initial salvo of Missions, so do those right away to have this limiter removed later in the game. You're going to quickly find that the coolest stuff can be found by going off the beaten path and poking your nose in where it doesn't belong. Break into every single terminal you can manage without raising a ruckus. Look for ducts to climb through. Don't let Restricted Areas stop you from exploring if you can manage it. Entire missions and storylines can be missed if you simply remain a law-abiding citizen, so allow the world to be your oyster.